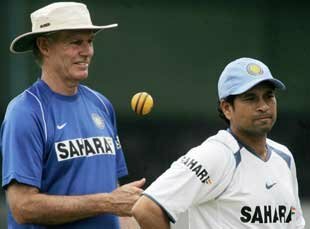 Sydney, December 17, 2011 (AFP): Former India coach Greg Chappell will share his knowledge of the Indian team with the out-of-sorts Australian squad ahead of the first Boxing Day Test next week, reports said on Saturday. New Aussie coach Mickey Arthur has asked Chappell to share his knowledge of Tendulkar and his teammates. The former Australia captain has been called in to help the struggling home side prepare for the key winter series. New coach Mickey Arthur asked Chappell to share his knowledge of India's batting maestro Sachin Tendulkar and his teammates, the Daily Telegraph reported. Tendulkar has been a perennial thorn in the side of Australia's bowlers, averaging 60.6 with 11 centuries in 31 Tests against them and is eyeing his 100th first-class hundred during the Australian tour. Yet Chappell, who coached India for a three-year spell ending in 2007, reveals in his autobiography 'Fierce Focus' that Tendulkar goes through phases where he was "surprisingly fragile." The book says Chappell tried to restore Tendulkar's lost confidence after the Little Master became "frustrated with his form and wracked with self-doubt."